The platform economy, a newly popular term, refers to businesses that serve as a platform to connect users and producers of a product: think of Airbnb, Uber, Etsy, or even Twitter or Paypal. Sometimes they are also called “sharing economy” firms. Are they sharing, though? Who is doing the sharing? These platforms connect suppliers of something – a room, a ride, a handcrafted gift, a 140 character message, or money – with someone who wants it. This is different than traditional business models. Platform economy companies typically do not make, maintain or distribute the underlying product. That’s a key difference between Airbnb, for example, and a traditional hotel, which builds, maintains, markets and supplies the lodging. Paypal, similarly, is not an actual bank, but connects people who want to pay each other. Why are these companies now worth so much money? Witness the power of the network effect: their value grows the more people use them. The real value in Airbnb is that if you are looking to rent out an extra room or empty place for a trip, you can go there and have a good sense that they’ve got most of the relevant spaces captured in their network. Similarly, the real value of Airbnb for you, if you have an extra room to rent, is that they’ve captured most of the users who are looking for a space like yours. The value in these platforms is not in the technology itself, but in the fact that we’ve collectively decided to use these platforms. And yet, these firms are often called “sharing economy” companies, because you are “sharing” someone’s house (Airbnb), or car (Uber). This isn’t sharing. This is renting. And you may be renting a product made under bad working conditions, to the benefit of private equity owners whose interests may not align with your own. We don’t own Uber, Airbnb, or Paypal, even though we’re the ones, in our collective usage and supplying of its product, driving the value. Beyond worrying as to whether your Uber driver is getting a fair deal out of this, why should you care about who owns the underlying platform? Look at PayPal and its co-founder Peter Thiel. He’s the billionaire who was one of the largest donors to the Trump campaign. What if Paypal had been jointly owned by its users, suppliers, and workers? Would that money still have been donated to Trump? Probably not. This is why ownership matters. Ownership determines who profits, and how profits get spent. Ideally, it should be the people who are really creating the value who receive that profit, and determine what to do with it. What’s the alternative? Well, there’s a tried and true model for owning companies like this. That’s the cooperative model, ideally suited for businesses where value is widely generated by a broad group of participants. And this is where the term platform cooperativism comes in. 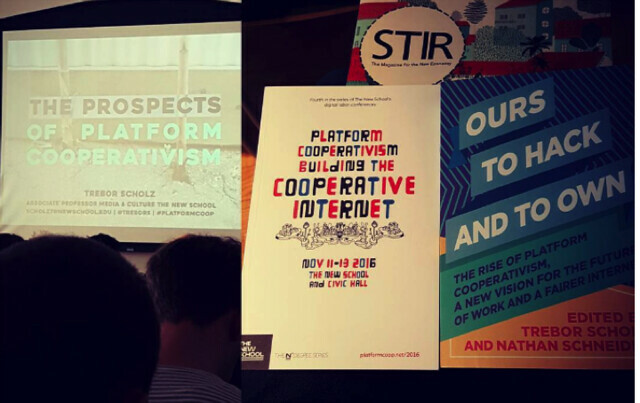 In November 2016, the Platform Cooperativism Conference at the New School in New York, NY featured participants from around the world, using democratic ownership models to put control of the internet and emerging “platform economy” into the hands of the people who are using and contributing to them. This isn’t just for elites, a common problem with high-tech stuff: working folk from all walks of life are part of this emerging sector. As an example of the first approach: a new, union-organized nurses’ cooperative in California is building an app, NursesCan, to handle mobile dispatch by hospitals and health care providers, to make house calls to largely low-income patients. Another example of this approach is Loconomics, the professional services freelancer’s cooperative answer to Mechanical Turk or Task Rabbit, based in San Francisco: need a party planner, account, mechanic, painter? Hop on Loconomics’ app and know that the worker-service providers actually own the company and app. A third example is GreenTaxi Coop in Denver, CO. Featuring hybrid and other high mile per gallon (MPG) vehicles, this coop grew as drivers from existing taxi companies formed a new entity to compete against scale at Uber. Armed with their own app, their model ensures the worker-owner cab drivers retain the profits from the business, rather than being shipped off to Uber’s out-of-market, private equity investors. An example of the second approach – creating a new platform to pair with an existing, old school cooperative businesses – can be found with Auckland, New Zealand’s largest taxi company, a driver-owned cooperative, which recently built an app to square off against Uber, too. Another type of example in this category: Coopify is an app, with a planned late 2016 launch in New York City, in which an existing Latina women’s house cleaner worker cooperative, Si Se Peude offers its services. As for the third type – converting an existing high tech platform into a coop – well, there is a campaign right now to cooperatize Twitter, #wearetwitter. Twitter is in financial trouble, and one option might be for its participants and workers to collectively own it, using a platform cooperative model. And while these examples may all be new, that doesn’t mean the platform cooperative model is an unproven one. In fact, based on my research, it may actually predate platform corporations, like Uber and Airbnb. The OCLC, the Ohio-based global non-profit, user-owned cooperative that powers 72,000 major libraries, archives, and museums’ interlibrary loan services through its WorldCat platform, has been around since the 1960s, demonstrating that the platform cooperative model has staying power. Technology is also being used in other new ways to offset some of the other challenges that cooperatives have historically faced, such as the cost and time involved in collaborative, democratic decision-making. Enter Loomio, a high-tech worker cooperative based in New Zealand, whose open-source technology tools are being used by coops and governments around the world to make collaborative decision making easier. December 2016: Loomio celebrated its fifth birthday in Wellington, NZ, with a film screening of “A New Economy”. 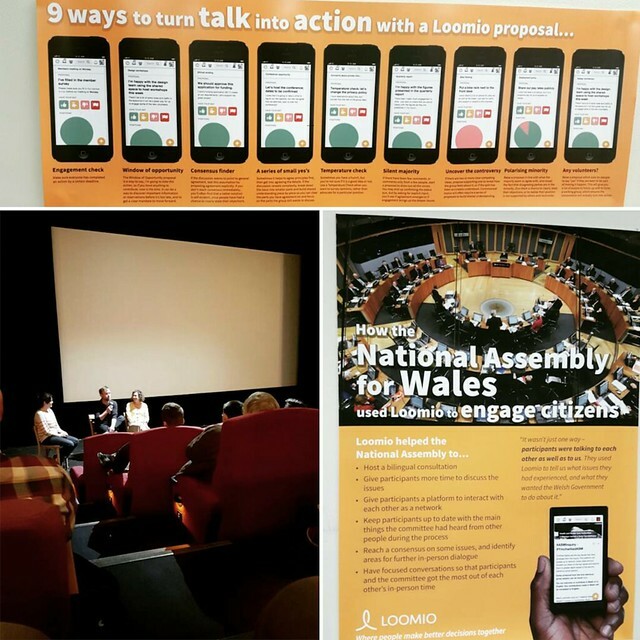 Posters at their office highlight how Loomio is being used worldwide. For a complete list of firms operating in this emerging space, check out CU-Boulder professor Nathan Schneider’s directory (The Internet of Ownership), or better yet, if you are in the Boston area, come hear him speak Friday, December 9th, 2016, at MIT, at 5pm, in Room 9-451A. The event is free and open to the public. Post and photos by Jason Spicer. Jason is a PhD Candidate in the Department of Urban Studies and Planning at MIT, currently completing research for a dissertation on the challenges that cooperatively-owned businesses in the US and other developed democracies face as they try to grow. This is the third post in a series on his research.